Disclaimer: All that information given in this Article is only for educational means, and the author of this blog will not hold responsibility for whatever you mess with this stuff. Here is a Simple batch virus that contains only 6 lines, has the tendency to replicate itself again and again and keeps on creating a folder with same name, until a user stops it. 2. Save it as a batch file with the extension .bat, before doing that you have to modify the code by changing the place where it says ‘username’ and instead of that replace it by the currently logged in username. 3. Then run it on the Victims computer to infect it. 4. Any how it doesn’t cause much harm, but replicates folder inside a folder and goes on. Once more thing that you have to notice is that, this will create directory inside another directory with the same name, so it doesn’t looks like crap, since everything reside inside one main directory, more over deleting the root directory will purge all the clumsy thing done by this piece of code. Batch file can has the tendency to modify the transfer zones by editing the hosts.txt file that resides inside ‘C:\windows\system32\drivers\etc\hosts.txt’, so that it will take you to some malicious websites instead of landing you to the legitimate website. This may also be used for phishing, i.e. redirecting you to a bogus website which looks exactly like the legitimate one, and then steal credentials. This program creates a new entry in the hosts file, so that whenever an user attempts to move to www.google.com, he will be re-directed to another host that has the IP address of 10.199.64.66, likewise if the user attempts to login to the paypal account by typing in www.paypal.com, he will be re-directed to another external bogus website that has the IP address of 10.199.64.67, where if the user enters the credentials unknowingly, they were into the hackers database and he can use it for several other purposes. Application bomber is a superset of window bomber, this has a close relation to the above given fork bomber program, where in this ‘application bomber’ we don’t call the program using the name itself (simply known as fork), where as we are going to open up applications continuously using a loop. When the above given batch program is executed, it will open up the following applications such as notepad, word document, Microsoft paint, WordPad, command prompt, my documents, control panel, and calculator in an infinite loop causing the system to collapse and as a result the system simply crashes or reboots. Just imagine the same using a fork concept; oops! it will make the system crash immediately. Message annoyer is a batch program that uses the same concept as above, but will interact with the user anyhow annoying and irritating them by popping up some message box containing some messages in it. This message box will pop up until for endless loop, which really annoys the person sitting before the computer. Even these small popup windows may crash the computer, if it overloads the memory. The ‘user flooder’ program will create a number of user accounts with random numbers, and assign administrator rights to them by itself, moreover the password set for those user accounts were too random numbers. 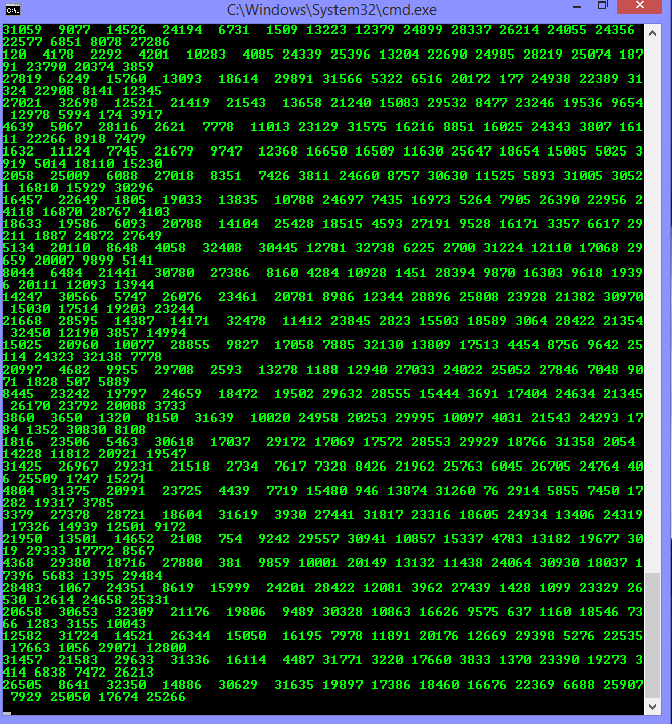 the ‘%random%’ is an environment variable that generates a random positive integer. We have set a variable manually named ‘usr’ for holding the random number generated by the %random%, then a new user account is created with the generated number as the account name and was assigned with a random password, then assigned with administrator rights, and this process gets repeated for a infinite loop, so it will create more than 50 user accounts in less than a minute. This will sure degrade the computer performance and the user will take a long long time to delete the user accounts, sometimes they will simply format their hard drives. The following piece of code is going to help flood you computer with junky folders. This program has the tendency to create more than 3000 folders in just less than a minute. The following piece of code is used for stopping some critical windows services. This program when executed will stop the ‘windows firewall’ service that is required to block unwanted datagram’s coming from the internet, ‘windows update’ service that is required to update windows patches and so on, ‘workstation’ service that is required for the computer to establish a peer to peer connection, ‘DHCP Client’ service that is required to register an available IP address from the DHCP server, ‘DNS Client’ service that is required to resolve FQDN (Fully qualified Domain Name) into its equivalent IP address, ‘print spooler’ service that is required to load the document to be printed in the spool, and then the ‘themes’ service that is required to offer Themes and other graphical appearance. Likewise you may stop any of the services, even the anti-virus service that offers protection from malwares will be stopped in this way. So when these services get stopped, it almost becomes impossible for the machine to offer the service what they are supposed to do so, hence the user has to manually enable and start these services again. The ‘broadcast bomber’ will broadcast messages infinitely to all the computers connected to this computer, if it is in a network. Likewise the ‘msg flooder’ program that we have seen already, this helps people to annoy multiple people sitting and working in front of various other computers connected with the same network. When the above piece of code gets executed, it will display a pop up windows. On all the computers that are connected with the same network, there by annoying everyone who uses the entire network. The following piece of batch program helps re-map the keystroke by changing the ‘scancodemap’ entry in the registry editor. The code that I have enclosed here changes the key from A to B, so that if any users press ‘a’ key on the keyboard he will be getting the ‘b’ displayed on the screen, likewise you may map any keys. If you want to create a new batch file for remapping other keys, you have to refer the ascii codes for each keys that was pre assigned, and you can download it from http://tinyurl.com/8ua4gk. This virus program is created by misusing the assoc command. The ‘assoc’ command is used for associating an extension with the appropriate file type, for example .txt extensions are supposed to be associated with textiles and so on. Here we are associating the native file extensions with some other type of file, which makes the program unable to open or display the file in right format. This will Update Keep Visiting.